Most of people like chocolates…. Chocolate flavoured dishes. I am one of them. I can say that I m a big fan of choclolates or addicted of chocolates. In a day I have to eat chocolate or chocolate flavoured dish. Often I used to make cakes n brownies of chocolate flavoured. Specially brownie. I love it. very yummiiee… creamy… chocolaty…. 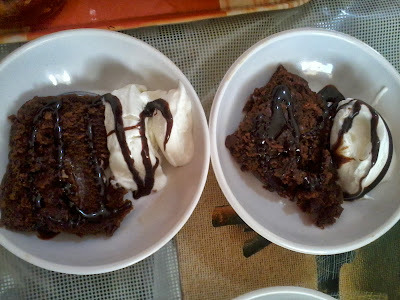 Hot brownie… Bt it takes good time to cook n also its pre-preparation. As I can’t wait for long time to eat this delicious dish , I find a trick to prepare this delicious dish more faster and easy. First in a bowl mix trio (bourn-bourn, hide ‘n’ seek, merry) bisuits in a small pieces form and mix it well. After it add sugar powder, drinking chocolate, cocoa powder and mix it. Than add milk and malai and mix it by blender for 10 to 15 minutes till it becomes smooth and creamy. Add baking soda in mixture and blend it for 2 mins. Take a microwave proof pan n grice it by butter. Add the mixture in it and garnish it with roasted walnut n cashew. put it for 4 mins in pre-heated microwave. After take it out put it in a fridger for 5 mins to set and its ready to serve. Note : We can serve it with choco or vanilla ice-cream with chocolate sauce and can make the moments and parties more special with this special dessert. Delicious looking brownie, looks so inviting. at how much temperature we should keep in the oven what degree C?